With CommuniTheme chosen GDM always falls back to starting the Gnome session. I have to switch to another session (gnome or ubuntu) manually and back to CommuniTheme first. Only then gnome-shell will start with CommuniTheme. @jyaku: are you using the wayland or Xorg session? Are you sure you are falled back to the GNOME session or just that the theme is unapplied? I tracked down a bug yesterday due to session living longer than expected and mixing environment in bionic, and so, you were starting communitheme (Wayland), but end up with Adwaita theme. If the bug persists, please print your environment variables (I guess opening a bug report would be better) in the “faulty” session. I used that opportunity to publish a now stable version after some testing. Enjoy! @didrocks is it possible to change the version after any update? Even if we stay on 0.1 maybe add 0.1b1 … 0.1bn like that we can track the version we are using. @Alculete: Changing versions at each commits doesn’t make sense. Versions are major versions that can be changed manually (probably more in the beta/release candidate state) when we get closer to release. As the project is the merge of 5 projects, adding the commit ID to the version would be bad as well. The number in () is the revision of the snap, you can communicate that to the developers. We can also imagine shipping a communitheme.version listing all commits IDs for every of the 5 projects + the revision of the snap. If someone want to work on that, It will be very welcomed I guess! Hey Didier, gorgeous work with the snap so far. Where is the best place to report regressions? On the update from 48 to 69 and 70, the GTK2 theme wasn’t loading into gimp. Just confirmed with reverting to 48 and restarting my session. It seems to work again now. Thanks a lot for all your efforts. [GitHub Issue] The orange circle in the top left seems odd because of the light gray squircle highlight around it though it is consistent to have that…maybe it should be an orange squircle or maybe it should be scrapped entirely, I don’t really miss it as much as I thought I would! But others do want it and disagree. Also the cross in Activities when hovering over windows is an orange circle (obviously without the gray squircle around it) which seems inconsistent with the current window close button (naturally). [GitHub PR] The Ubuntu button in the bottom-left was, I thought, a direct contravention of what @didrocks has designed before, he wanted to keep this in line with upstream? Also it seems a tad confusing because of the Activities button existing too…the GNOME Applications button clearly showed that the button was for showing applications…though since we have the Dock maybe the button people should be using more frequently is the Applications button (since people don’t need to window switch with the mouse via Activities) and having the Ubuntu logo for that will make people do that more often, I think, but it is still an additional deviation from upstream design that I feel @didrocks needs to explicitly approve somewhere (and I haven’t noticed he has anywhere). Maybe just an indication from him that he can tolerate the change if the communitheme does roll with it in the end. I’m not as bothered by the lack of many squircle icons as I thought I would be but I still feel that eventually, for consistency (and I think it was the case in Ubuntu Touch’s apps? ), all icons should use squircles, maybe via a script? [compliment!] The top bar looks good, the white highlight when a window is maximized helps to emphasize the divided between top bar and window (more than top bar and menu) in a really good-looking way! [Decision - Won’t Fix until on 18.10] The session (as listed in GDM) needs a rename. 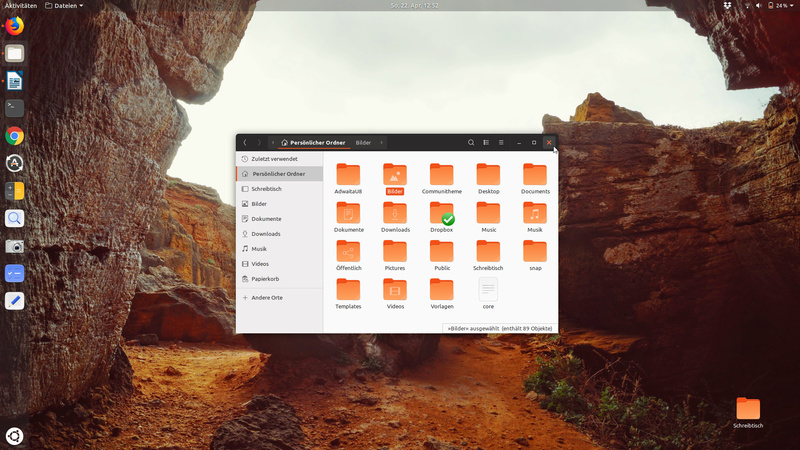 I think the ‘snap’ part of ‘Ubuntu with communitheme snap’ needs to be scrapped. It should just read ‘Ubuntu with communitheme’. E.g. ‘Ubuntu with communitheme snap with Wayland’ is very long and ‘Ubuntu with communitheme with Wayland’ is more acceptable, imho. Though maybe people find it a useful indicator if the session is using the snap or not? Maybe there’s another way to work out if you’re using the snap or not when you’re in the session? White highlight around windows when hovering over them in Activities, is this intentional? @c-lobrano did this get fixed? I still have this, if the communitheme is using an orange outline around search boxes maybe it should use an orange outline around the windows (in Activities) as well? @ads20000 The theme uses orange now mostly as lines or dots. The color is very attention-grabbing and does not need bigger orange fields. That is why it looks so elegant at the moment. The orange is used for “activated” or “selected” states while blue is used to show progress (progressbar) or for sliders (volumeslider). The text-selection-color was changed to blue too because it looked more like salmon or even pink on some displays. And because unity 8 used blue too. I understand that it can be confusing because the orange is still used in libreoffice and icon-selection while on firefox or gedit blue is used. IMHO selection-color for content should be blue everywhere. That means selected text or even selected files. Selection-color for the system should be orange. That means when parts of the system are selected or activated (in stackswitcher, sidebar or topbar). This way it would be consistent and comprehensibly. The makers of the theme will test and check what needs to be changed. So lets see what the future brings. I think so too. It would be nice when this made possible. The orange circle in the top left seems odd because of the light gray squircle highlight around it though it is consistent to have that…maybe it should be an orange squircle or maybe it should be scrapped entirely, I don’t really miss it as much as I thought I would! But at the moment there are no plans to change the close-button. But i am pretty sure a change will come. You mean the close-button? On my system it is on the right. Yes sorry I changed it to the left because imho it makes so much more sense mouse-travel-wise but I agree with the decision to move it to the right by default because that’s the upstream default and putting it on the left is an unnecessary deviation. Just report against the github gtk-communitheme project for now, I’ll let the core communitheme team have a first look. I’m focused on the ubuntu 18.04 release this week Also, nothing on the snap itself changed, so maybe someone can diff the 2 versions, have a first investigation so that we spot where this regression is coming from and fix it. The Ubuntu button in the bottom-left was, I thought, a direct contravention of what @didrocks has designed before, he wanted to keep this in line with upstream? Also it seems a tad confusing because of the Activities button existing too…the GNOME Applications button clearly showed that the button was for showing applications…though since we have the Dock maybe the button people should be using more frequently is the Applications button (since people don’t need to window switch with the mouse via Activities) and having the Ubuntu logo for that will make people do that more often, I think, but it is still an additional deviation from upstream design that I feel @didrocks needs to explicitly approve somewhere (and I haven’t noticed he has anywhere). Maybe just an indication from him that he can tolerate the change if the communitheme does roll with it in the end. Edit: on the session name, I preferred to have an explicit name (which is already translated on many languages, so not a good idea to change it as this point). Anyway, this session will vanish as some point as the default “ubuntu” session will take communitheme. You are talking about the original grid button in gnome, right? I think this is a bit more complex. I am having the same problem. Neither GIMP nor Inkscape are themed (they are not snaps). I think they were themed a some time ago, but maybe I had the ppa enabled then. And another interview today: @merlijn-sebrechts. Thanks for answering!